History: (What If II#4) - As Spider-Man and the Black Cat swung over the city, Felicia noted that Spidey seemed not himself. When he told her he was feeling run down lately, she suggested he might have caught some space-disease while off-planet (for the Secret Wars) and took off while suggesting he get it checked out. First Peter went to the Fantastic Four's headquarters, but finding they weren't home he turned to Curt Connors. Connors gave Peter a CAT-scan, but was unable to find any cause for his fatigue. Several days later the Fantastic Four returned and Spider-Man was able to see Reed Richards. 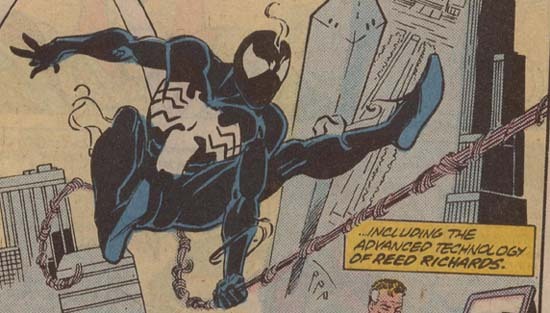 Reed identified Spider-Man's costume as being a living symbiote and tried to remove it, but too much time had passed and the sonics Richards used were not enough. Peter told Richards that he could feel the symbiote taking over his mind. Reed and the Human Torch managed to contain the now-possessed Spider-Man, but not knowing how to help him, Reed called Dr. Strange for help. 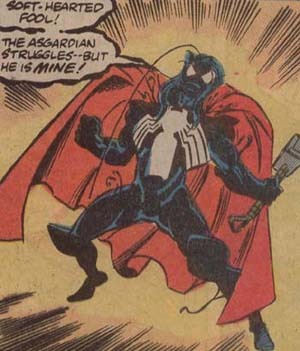 Strange spent hours attempting various spells, but none were able to separate the symbiote from its victim. As Reed and Strange discussed what they were going to do, Spider-Man took advantage of their distraction, shattered his cage and escaped. With a final attempt at regaining control of his mind, Peter called Felicia and tried to ask for help before the alien took over once more. Felicia confronted Richards, blaming him, and then out of sheer spite broke into an auction house and stole some jewels, which she gave to some homeless persons. Days later three SHIELD agents were killed by the mindless Hulk, who was now confronted by Thor and the Avengers. Dr. Strange arrived and informed the others that the Hulk was being manipulated by Nightmare and began a spell to send the Hulk to the Crossroads dimension. Before that could happen however, Spider-Man appeared and pulled Hulk from the portal, drop-kicked Strange and jumped onto the Hulk. The symbiote abandoned the withered body of Peter Parker and bonded with the Hulk, having little trouble taking over the Hulk in his mindless state. The Hulk lashed out and fled as the Avengers and Strange tended to Peter. Peter, now physically like a man in his mid-eighties, recovered in the Avengers Mansion. Black Cat demanded that the team find the Hulk and kill the alien, even if it meant Banner had to die. Peter visited Forest Hills, where he introduced himself to his Aunt May as one of Peter's co-workers and told her not to worry because he was sure Peter would be fine. May confided in Mary Jane Watson that it seemed to her as if that visitor had been Peter himself. The next day Reed Richards found Peter dead in his office, of old age. 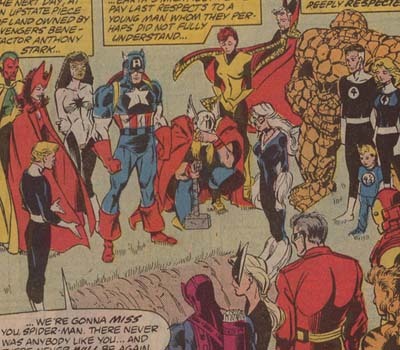 The Avengers (of both coasts), the Fantastic Four and Doctor Strange had a funeral for Spider-Man. After all the guests but the Black Cat were gone, Wilson Fisk arrived to pay his own respects. He offered Felicia a ride back to town and she accepted. Two days later Reed Richards finished working with his own research and the notes Peter was working on as he died, to create two devices, one to track the creature and one, an "omni-blaster" that would kill it and Banner, which he only wanted to use as a last resort. Gathering a team of heroes, Richards tracked the alien to Mount Rushmore where they split up to find it. Thor, feeling weakened by a recent battle with Surtur, found the symbiote and demanded it surrender. The creature refused to be imprisoned again and fought until Thor apparently knocked it out. Finding the body of Bruce Banner still alive, Thor was distracted when the symbiote then tried to bond with him. (Quasar#30) - Quasar briefly journeyed through this world while searching for counterparts of the Living Laser, and glimpsed the confrontation with the symbiote. (What If II#4) - The other heroes found Thor struggling with the alien, but Strange's magics and Reed's sonic attacks were useless against it. Reed refused to use the omni-blaster until he was sure they could not save Thor. The alien hid in a cave and attacks by the Human Torch and Captain Marvel had no effect. Strange and the Vision told Reed it was time to use the omni-blaster, but Reed asked for half an hour to try one more plan. Half an hour later the creature, now almost entirly dominant over Thor, noted someone entering its cave, and looked to find Black Bolt. The symbiote tried to attack, but before it could do anything Black Bolt screamed, bringing down all of Mount Rushmore. Thor was freed from the alien and Reed detected that the symbiote was wounded, but still alive. Strange began to recite his spell to send the creature to the Crossroads Dimension, but before he could finish, the alien was killed. 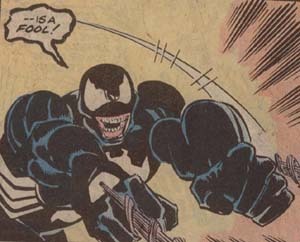 The Black Cat scolded the heroes for not going through with killing the monster that had killed Spider-Man, which is why she gave copies of Peter's notes to the Kingpin who had had his own scientists build a second omni-blaster and given it to her, in exchange for her agreeing to work for him for life. To quote this issue itself "Did the CAT-Scan radiation accelerate the bonding, or did Peter Parker simply wait too long to see Reed Richards? There are no easy answers..." I suppose if we looked at some other example of a symbiote's bonding with a human and saw how long it took, we could see what a typical length of time for it to happen might be. The three SHIELD agents that died during the Hulk's fight were not identified, but I get the impression from the narration that in the original stories Spider-Man had been there to save them. I haven't read that story (Hulk II#300, I bet), but it may clarify who those agents were, if they were identified at all. The alien symbiote came to Earth as Peter Parker's costume, as it did on Earth-616, but here it was not removed from Peter in time. The combined efforts of Reed Richards and Doctor Strange were not enough to separate the alien from its host and the alien was able to escape. It fed off of Peter's adrenalin until it was too much for the human's body and aged him prematurely. Seeking a new source of power, it tracked down the Hulk and easily took over his body, abandoning Peter's. When all of the Hulk's power had aparently been used up, the symbiote abandoned the now powerless Banner and attempted to attach itself to Thor. At this point the alien was able to fend off attacks from the Human Torch and Captain Marvel while mentally stuggling with Thor. But when Reed Richards called in Black Bolt, the alien's weakness to sonic attacks led to its defeat. Barely alive, the heroes attempted to send the alien to the Crossroads Dimension, but before they could, it was killed by the Black Cat using an omni-blaster of her own.